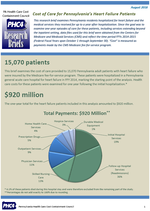 This research brief examines adult Pennsylvania Medicare fee-for-service residents hospitalized for heart failure and the medical services they received for up to a year after hospitalization. Since the goal was to examine services extending beyond the inpatient setting, data files used for this brief were obtained from the Centers for Medicare and Medicaid Services. Cost breakdowns by service type are provided. Population-based rates by county are also shown.